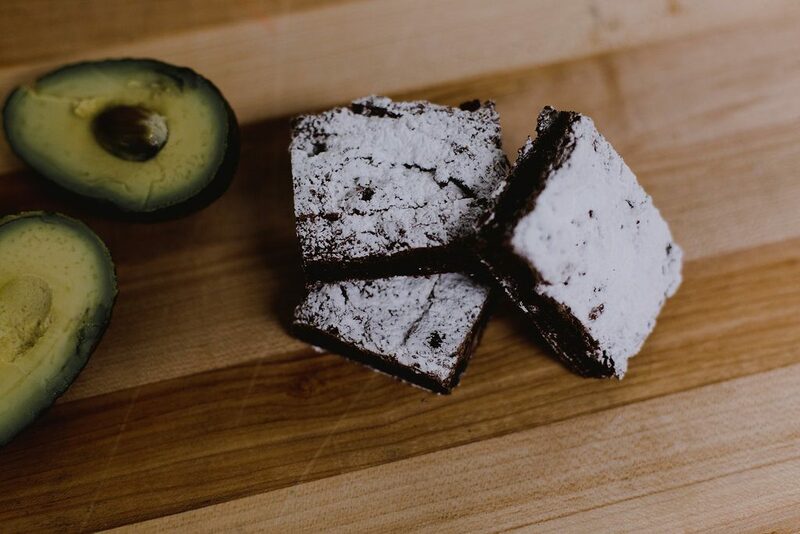 The combination of avocado and chocolate may have you scratching your head, but our vegan and gluten-free Avocado Brownies have quickly become a customer-favorite. 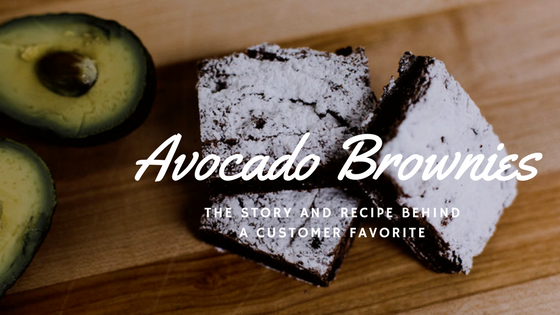 This recipe for avocado brownies came about when we did a version of it in my Alternative Baking class at The University of Charleston. My pastry chef instructor taught it to me and I have loved it since that first time making them. I enjoyed this class because I found it so fascinating to learn what ingredients I could use as substitutes for food items that may bother people with food allergies. I’ve always loved the combination of chocolate and avocado. I love how unusual it is and yet it works so well. 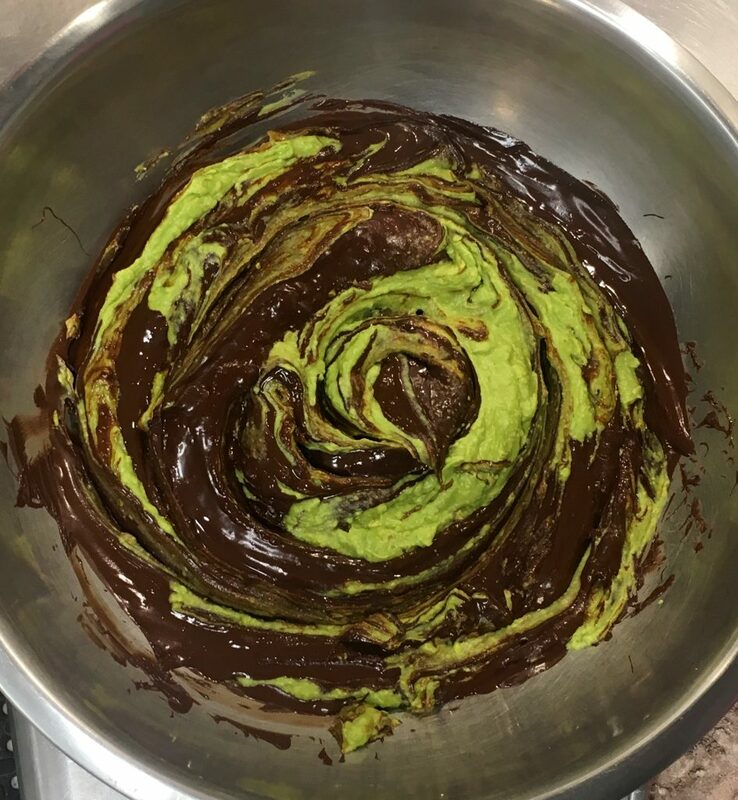 Also, I am obsessed with the color combination of the bright avocado green against the dark chocolate as I am mixing them together. It’s fun to tell someone what are in these brownies. Often they think the initial idea of it is gross and don’t want to eat them but as soon as they try the brownies, they absolutely love them. As much as I liked the recipe though I felt like I could take it a step further and make it entirely gluten-free and dairy-free. I had to play around with some different gluten-free flours but once I found the right one it was worth it. I have not had much luck with blends containing brown rice flour, as they tend to make my products grainy. Even though the taste is still good, you can tell the finished product is gluten-free. For my avocado brownie recipe, I ended up settling on an all purpose gluten-free flour with a base of garbanzo bean flour. The flavor of the garbanzo beans can be strong but works perfectly in the brownies because the deep chocolate flavor keeps it in check, and the texture is so much nicer. For recommended brands, I am a big fan of Bob’s Red Mill gluten-free flours. Their products are very high quality, and the company has so many different varieties of each flour that it’s easy to meet the need. One of the other things that makes these brownies so special is the chocolate we use. I would recommend a high quality chocolate such as what you can find at Trader Joe’s. Their semi-sweet chocolate chips are not only delicious, but gluten- and dairy-free and very affordable. High quality chocolate adds so much to the chocolatey base of the brownies and pairs nicely with the chocolate chips we add to the batter at the end for an extra-chocolatey flavor and additional texture. 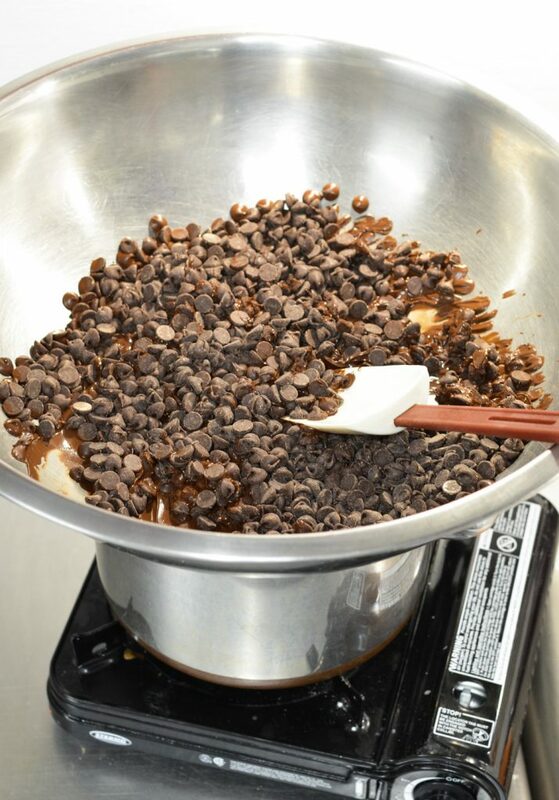 To keep the chocolate from scorching and to help it melt evenly, we use a double boiler method to melt the chocolate. The avocados, though they seem strange, work as a binding agent, replacing the eggs so that these brownies are 100% vegan. They have a nice thick and even texture when they’re pureed and that plays a big part in the wonderful chewy consistency of the brownies. Another thing I love about avocados is how healthy they are. They’re full of vitamins C and K and folate and they’re loaded with healthy monounsaturated fats. And surprisingly, avocados have more potassium than bananas. So you can feel good about eating these brownies! It’s important to use avocados that are soft and ripe. If you have ever tried to mash up an avocado that wasn’t quite ripe, you know frustrating it can. If we can’t find the right avocados, we may not make these for our bakery. 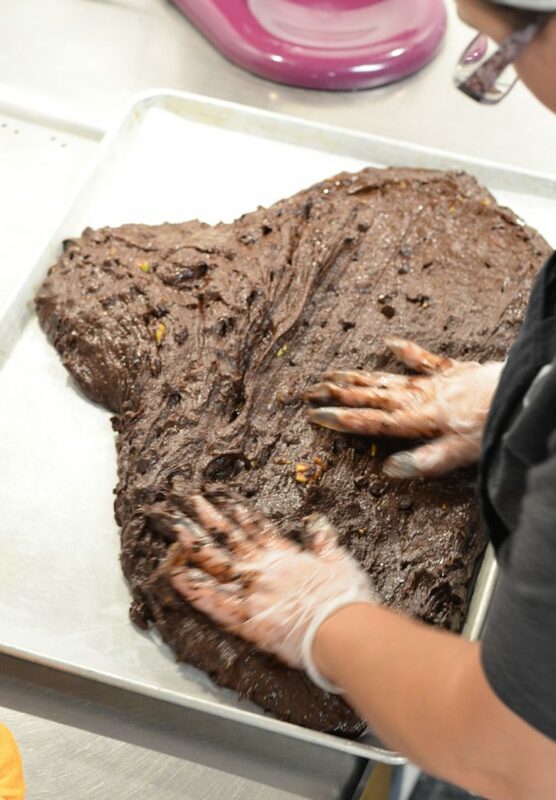 We don’t want our customers to take a bite of our brownies and get a huge chunk of avocado! Although I have not tried it yet, I believe that applesauce could be used as a substitute for avocado. The brownies may not have quite the rich, chewy texture, but they would still be gluten- and dairy-free and delicious. 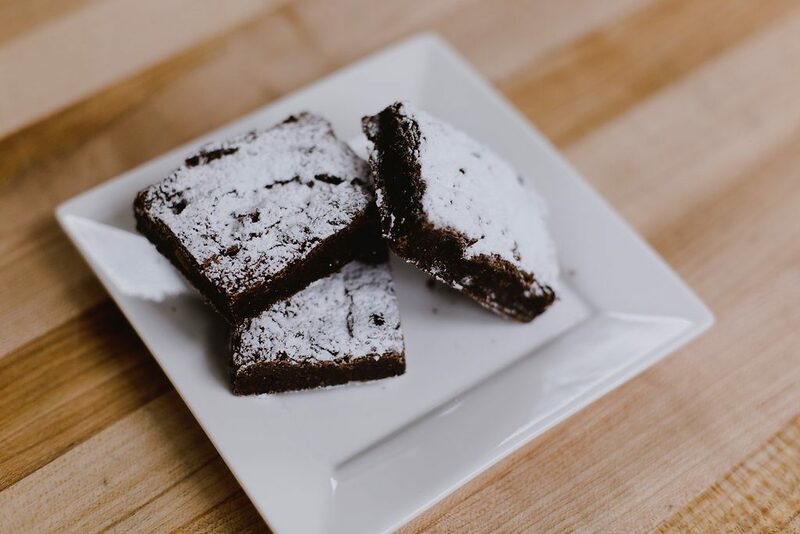 With avocados and gluten-free flour, it’s naturally vegan and gluten-free, so it’s perfect for people with food allergies, or those who just love a great brownie.If you’re feeling brave, go ahead and give this recipe a try. Or, if you want someone to take care of the baking for you, pop on down to the Rabbit Hole. This customer favorite will surprise and delight even the skeptics. First place the chocolate over a double boiler and melt completely. While waiting for the chocolate to melt, scoop out the avocados and puree them in a food processor. 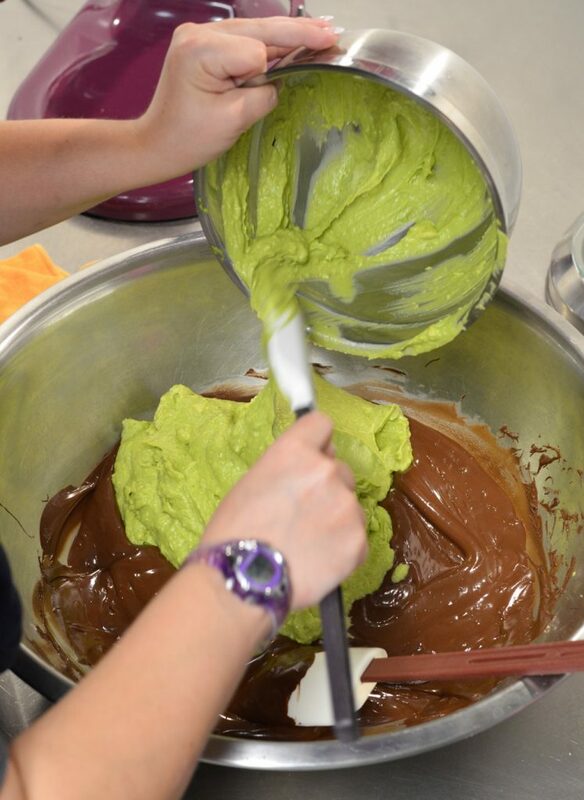 Once completely smooth mix the avocado puree into the melted, slightly cooled chocolate and mix well. Whisk in sugar and vanilla. In a separate bowl whisk together the gluten free flour, cocoa powder, baking powder and salt. 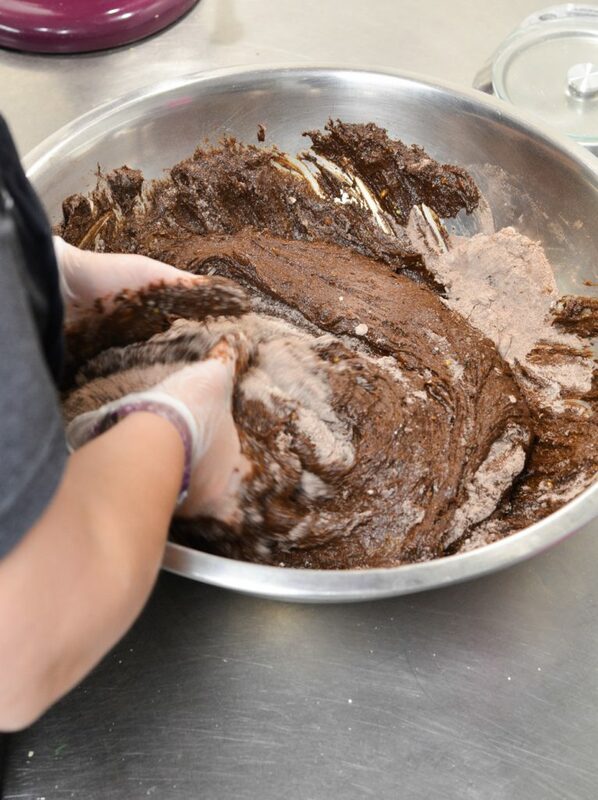 Mix into the chocolate mixture completely, followed by the avocado oil. Pour into a prepared pan (9X9-inch) and bake at 350 degrees for about 30 min. LOVE THIS! Thank you so much for sharing. We have so many food allergies in our house, this is a true winner!